You will hear or see lots of comments and advice on keeping your dog healthy that relate primarily to what you feed them and giving them plenty of exercise. These are both important; however, one aspect of their well-being which is often overlooked is their grooming. Even if you groom your dog, finding a comb or brush that is effective and comfortable for you to use can be a problem. That's why we are going to review a unique grooming tool from 'Groom Ninja' to see if we can untangle the facts about how good it really is. 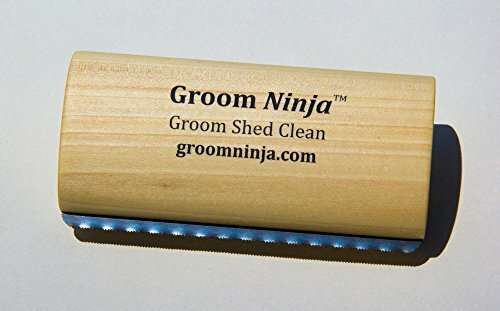 The Groom Ninja grooming tool is probably one of the simplest products we have ever had the pleasure of reviewing, and as we have found with so many of them, the simpler ones tend to be the most effective. The product was first released in 2016, so it is a relatively new entry into this category. It has been designed, and is made, in the USA, and it has a patent pending on its design. There are three sizes which you can purchase depending on the size of your dog, which not surprisingly are small, medium and large. Normally, at this point, we talk about dog owners, but Groom Ninja have customers with cats, horses, rabbits and even cattle who have used it successfully to groom their pets and livestock, so it is not exclusively a dog grooming tool. However, dogs are who it is mainly designed for, so let’s talk about them now. If your dog's fur tends to get matted, or if they play outside a lot and are always getting dirty, this tool will work for them. In addition, if your dog suffers from dander, it is suitable for dealing with that too. In terms of coat types, it works for dogs with short hair or long hair. It also grooms dogs with a 'double coat' such as huskies and wire-haired small terriers, where they often have a soft undercoat and a stronger outercoat. Dogs who do not shed, like Poodles and Shih Tzus, may not benefit as much in terms of grooming their fur, but the tool will still help keep them clean and will remove any dander they may have. Not a lot to say here except that you receive the Groom Ninja Grooming Tool. There are no instructions included, but instead, you are directed online to watch a video on Groom Ninja's YouTube channel to see how to use it. This is probably a better way to see how to groom your dog correctly than just reading about it anyway. One immediate feature of this grooming tool which we noticed and liked is its sheer simplicity. It consists of only two main components, namely a shaped wooden block, which is the handle, and the steel comb, at the base of it. There are no weak plastic parts to break, and it feels solid so it is should last. If there were any issues on that score, you have the one-year manufacturer's guarantee to fall back on. The wooden handle has been designed specifically to feel comfortable when you hold it. Its ergonomically curved shape is ideal for your thumb to sit comfortably on one side, whilst your fingers can curve over the other side of it. Your hand being comfortable is important because often it can take 15 or 20 minutes to properly groom your dog, so the more comfortable your hand is the better. Otherwise the risk is you cut short the session and your dog's fur is not properly brushed nor groomed. As you use the tool you will see how effective it is at collecting old, dry, and dead fur from your dog's coat. Rather than having to remove it with each stroke, you gradually accumulate it as you go along meaning you discard it one or two times rather than every few seconds which can be tedious. We've already mentioned that the handle is ergonomically designed so holding it should feel comfortable and natural. To use the grooming tool effectively, hold it with your thumb on the concave curved side and your fingers on the other side. Then you need to employ what the manufacturers call, the 'Groom Ninja Flick'. Don't worry, it's not some move that Mr. Miyagi teaches in ‘The Karate Kid’. Instead, it is a brush stroke which you start by moving the tool across your dog's fur. At the end of the stroke, you lift or 'flick' the tool up and away from your dog's body. The last bit doesn't need to be extravagant, but just enough so that the tool is lifted, and in that way, it will take with it the fur which it has collected. You can continue with these flicks until all the dead fur has been lifted. Then it can be lifted away in one go and disposed of. We mentioned above the other animals it can be used to groom, but it has also been proven to be effective on saddles, upholstery, rugs, and carpets. There are probably as many different types of grooming tools as there are breeds of dog; however, there are only a few which really stand out as being entirely effective. One such tool is the ingeniously named 'Furminator' which is one of the most popular and successful dog products ever produced. It has versions for long and short hair and comes in different sizes to obviously coincide with the size of your dog. Its main features are that it has an ergonomic handle, a stainless-steel comb, and the fur accumulated on the comb can be released by pressing a button on the back of the comb. The Groom Ninja Grooming Tool is an innovative product whose design considers the needs of both the user and the dog. First, its ergonomic design makes it easier to hold, and the flick action allows you to easily collect hair in one spot and get rid of it easily. For your dog, not only do they get to enjoy being pampered, but the removal of dead, matted, dirty fur and dander will do wonders for the health of their coat and their skin. This is a small and inexpensive grooming aid which every dog owner should consider trying.